(Phys.org) —A team of researchers in Spain has found that at least one species of cuckoo bird may actually help its nest-mates survive. In their paper published in the journal Science, the team describes how in studying the great spotted cuckoo, they found that crow hatchlings were actually more successful due to the presence of an uninvited bird. Most everyone knows that cuckoo birds are the ultimate free-loaders. 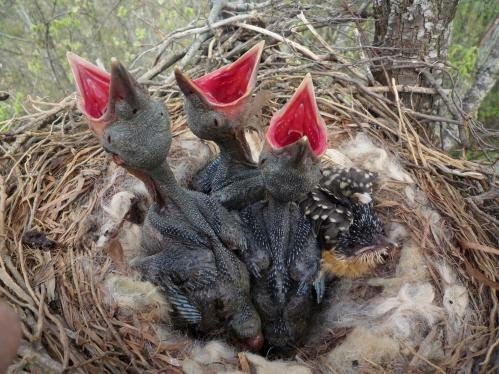 Mothers lay their eggs in the nests of birds of different species, leaving them to raise their young for them. What many may not realize however, is that different kinds of cuckoo birds behave differently when they hatch. Some famously push all the other eggs out of the nest, leaving themselves as the sole survivor and beneficiary. Other's however, don't do that, instead, they leave the other chicks alone and share in food the mother brings, acting as an adopted sibling, of sorts. At first glance it would appear that the host birds gain no benefit from this arrangement, but upon closer inspection, that assumption has been proved wrong.